I’ve just started to catch up on the sixth & last season of House of Cards (a little late to the party, I know!) and I’m totally crushing on the set decor this season! The homes and offices of the rich & powerful in this murky, murky political drama, have been created / re-created beautifully by set decorator Tiffany Zappulla. From the Oval Office, to a swanky oceanfront home, to the famous Hay Adams Hotel in D.C., she’s done an incredible job. To think - at some point all these gorgeous sets would’ve been taken down & stored away. Send them my way people! I’ll gladly find a home (my home) for those Schumacher curtains. I thought it’d be fun to ID some of my favorite elements in a few scenes. Here goes! 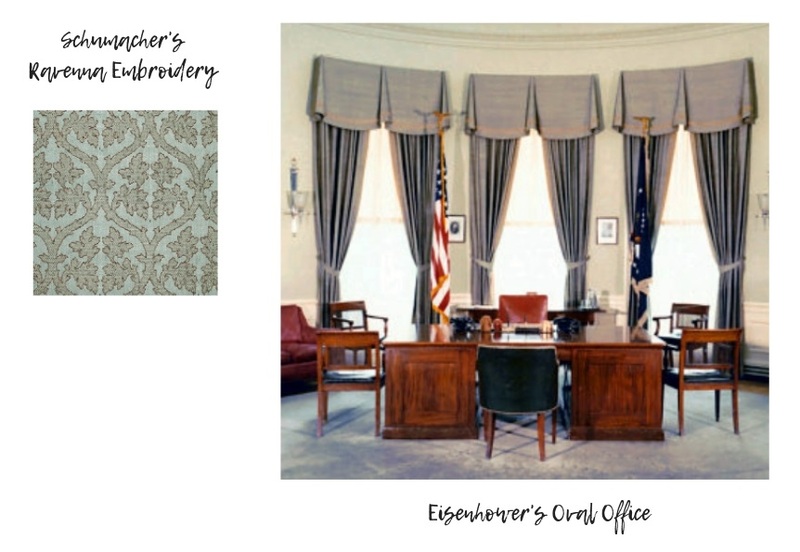 Love the curtains framing the president’s desk. They’re dramatic and imposing but with a feminine touch - fitting for the first female president. They’re in Schumacher’s Ravenna Embroidery Mineral. (shared by Schumacher in their monthly update). Also, it’s possible they took inspiration from Eisenhower’s Oval Office - I found this vintage shot and it seems reminiscent! Want a similar vibe? Pottery Barn’s mineral blue linen drapes . I really liked the landscapes & seascapes. Lots of blues and greens. The symmetry lends the rooms an air of formality. Similar - great modern landscapes by Chelsea Fly ! Love this glassy wave painting. Here. This might be one of my favorite scenes. Diane Lane is soooooooo good in it. As is that chinoiserie wallpaper! Spoonflower, Tempaper - affordable. The icy blue wallpaper at the bottom is Tempaper and it’s stunnnnning. Lots to love here - that very chic striped sofa + the equestrian art on the walls! Here’s how I’d do it - Duralee’s camel back sofa in this Lee Jofa Kailash stripe fabric. Here’s Claire Underwood getting a earful from Jade, while I’m admiring the headboard in the background. Because, priorities. Anyone else watching House of Cards? What do you think of this season? Did it live up to expectations?